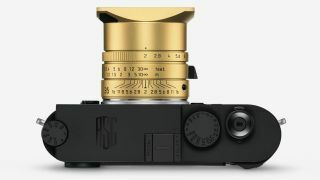 Based around an adapted Leica M10-P, the Leica M10-P “ASC 100 Edition” is named after the American Society of Photographers, which was founded in 1919 and celebrates its 100th anniversary in 2019. Its launch is timed to coincide with the 33rd ASC awards in February 2019, though the camera itself won’t be available until Autumn 2019. Leica says the ASC has “influenced and shaped the way people of all cultures see the world”, and highlights the parallels between the ASC’s cultural impact in cinematography and its own in photography. There are historical connections, as Leica inventor Oscar Barnack took the 35mm motion film being used at the time and flipped it sideways to make the 36 x 24mm 35mm film format used in the original “Ur-Leica”. It was used not just for stills photography but to ‘preview’ film compositions and angles much more efficiently than running rolls of film through a movie camera. In a special adaptation to reflect this role, the Leica M10-P “ASC 100 Edition” offers alternative cinematography aspect ratios, displayed as bright-line frames in its optical viewfinder, and two special Cine Looks: its ASC Cine Classic mode offers an analog 35mm motion film look, while the ASC Contemporary mode gives the digital look of contemporary movies. If you actually want to shoot video, though, you need one of the cameras in our best 4K camera for filmmaking list. The kit includes a Visoflex electronic viewfinder, Leica M-PL mount adaptor, for attaching the PL-mount lenses widely used in film-making, and Summicron-M 35mm f/2 ASPH. gold-coloured lens. Leica has been making strictly-controlled limited editions since 1975. This one is hand-crafted in the Leica factory and comes in a prestigious presentation set, making even the unboxing ceremony a red-carpet event. The Leica M10-P “ASC 100 Edition” will be available from Autumn 2019, but the price has yet to be disclosed!